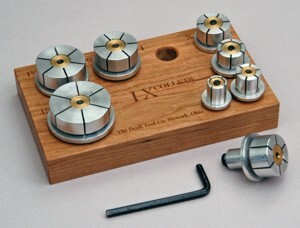 Beall I-X (internal expanding) Collets are new products just for wood turners which can be used instead of jam chucks to mount turnings on a lathe. Insert one in a hole bored in your work and the jaws will expand inside to clamp it securely. They are made from a hard anodized aluminum and adjustable from the back with a hex key (included). I-X Collets have a 1/2" mounting shaft which enables them to be used with a standard drill chuck, but they are also great accessories for the Beall Collet Chuck. Sizes fit inside hole diameters from 1/2" to 1-1/2" and come in one eighth inch increments. You may choose to purchase them individually, but the full set comes with a handsome cherry mounting block that will make you the envy of all the turners on your block.